Hazelnuts and chocolate is one of my favorite combinations, so it’s no wonder I’ve decided to use both in the form of cookies. 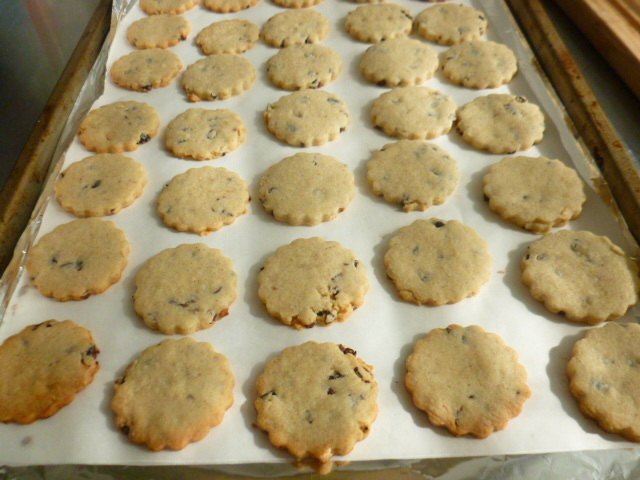 To this, I added some cardamom powder, which enhanced the cookies with its wonderful, warm aroma. 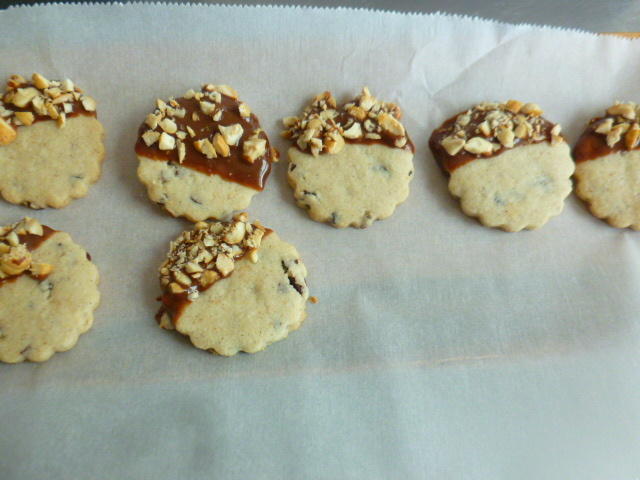 To make things even more interesting, I divided the dough in half, and prepared different shaped cookies from each half. 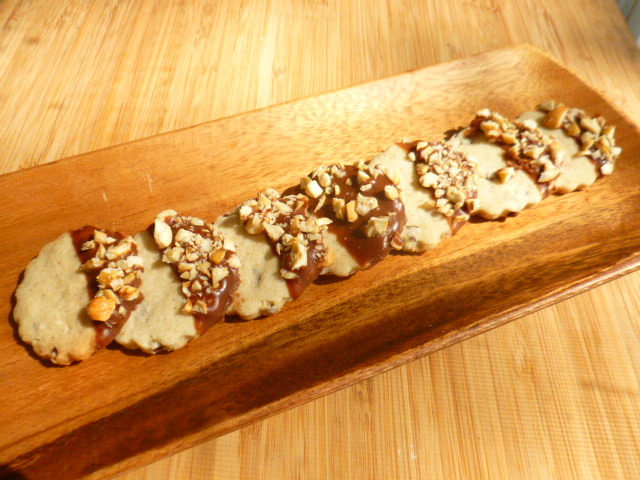 Once baked, I also dipped some of the cut-out cookies in melted chocolate and chopped hazelnuts, which made for a more festive presentation. You can choose which way you prefer for preparing these cookies, or use all, as I have done. Whichever you’ll choose, I’m sure you’ll enjoy these tasty and delicate cookies. 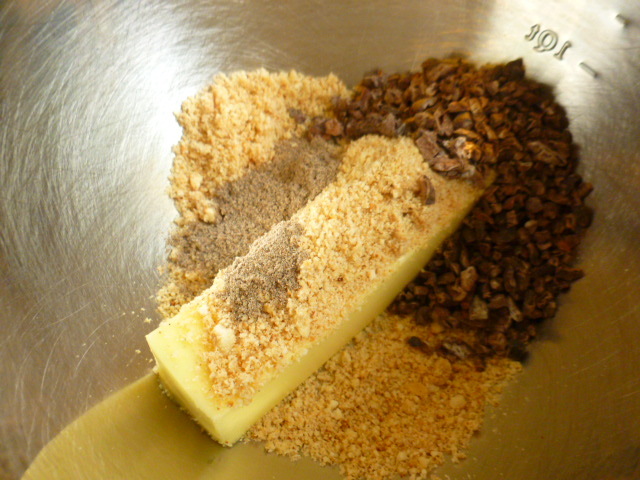 * Cacao nibs are roughly chopped cacao beans. 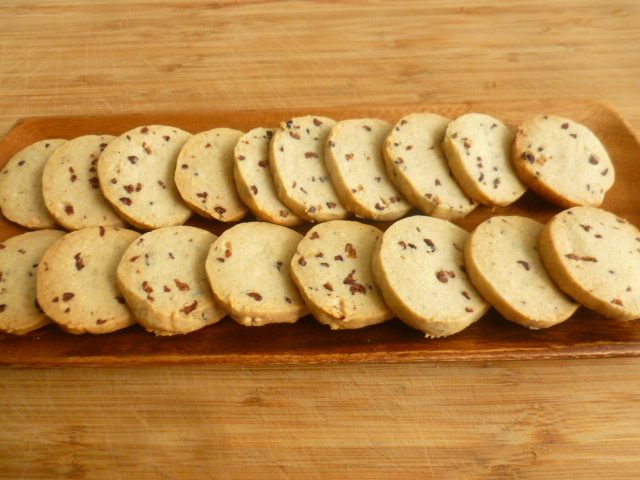 They add a unique crunchy texture and a slightly bitter chocolaty flavor to the cookies. They can be found in specialty stores or online. 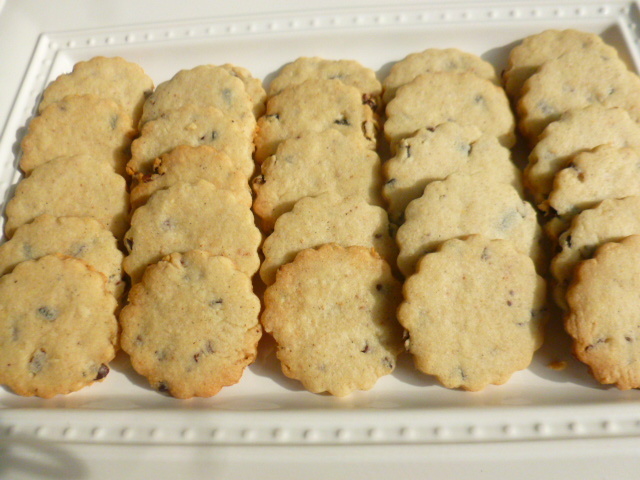 If you can’t find them, dark mini chocolate chips can be used instead. 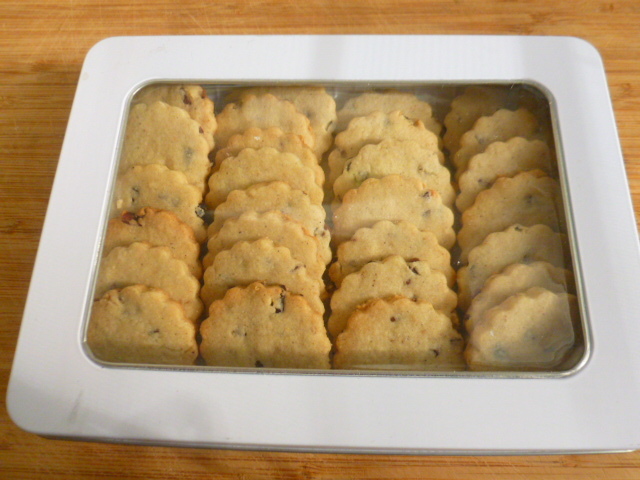 * The baked cookies can keep, in an airtight container, for up to a week. 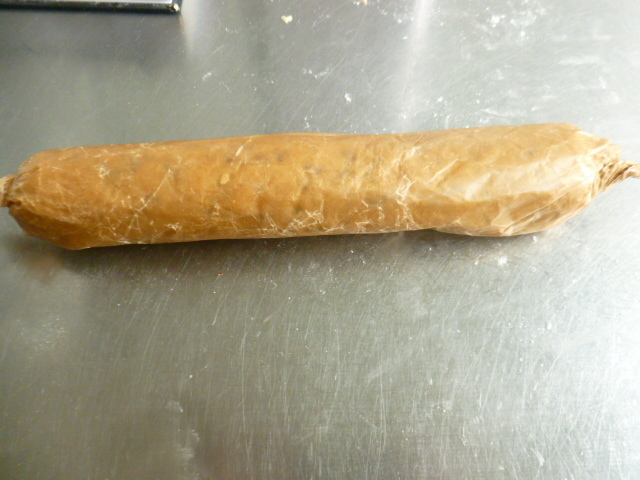 The dough log can be frozen, in a freezer bag, for up to a month. 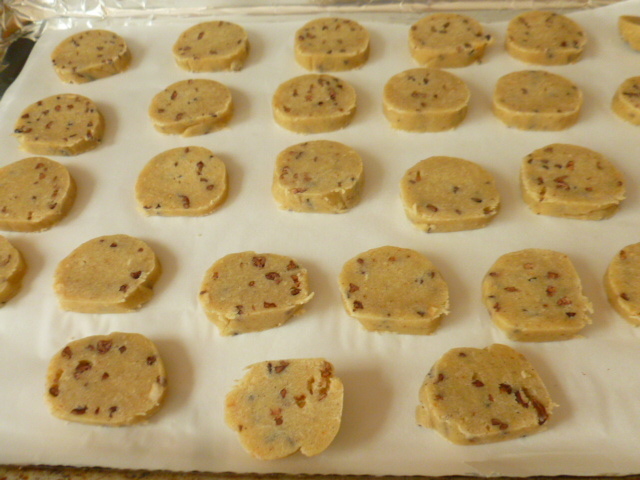 To bake the cookies from frozen, add 2-3 minutes to the baking time given here. 1. 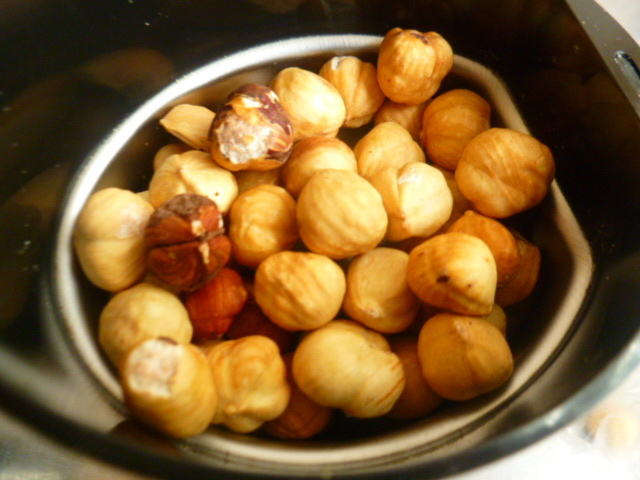 Place the hazelnuts in a toaster oven and lightly toast them. Cool to room temperature and finely grind them in a spice grinder, or in a small food processor. You should end up with ½ cup hazelnut meal. 2. 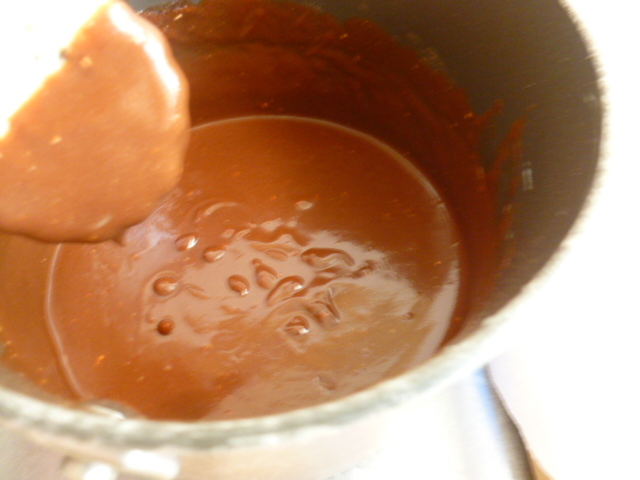 In a large bowl, whisk together the hazelnut meal, butter, cardamom, cacao nibs, sugar and egg. 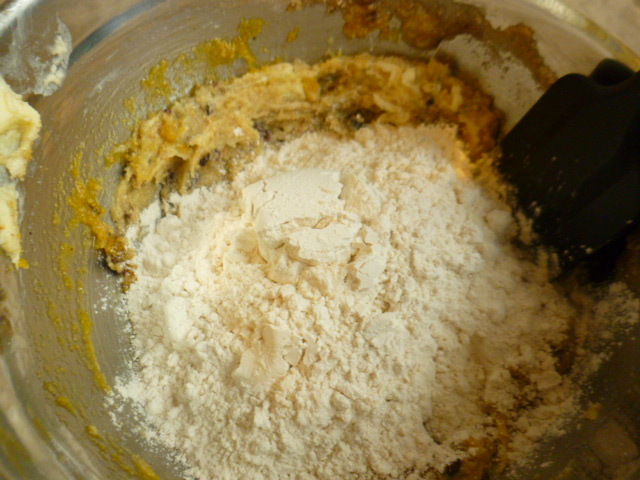 Add the flour, cornstarch and salt and mix briefly, just until the dough is formed. 3. 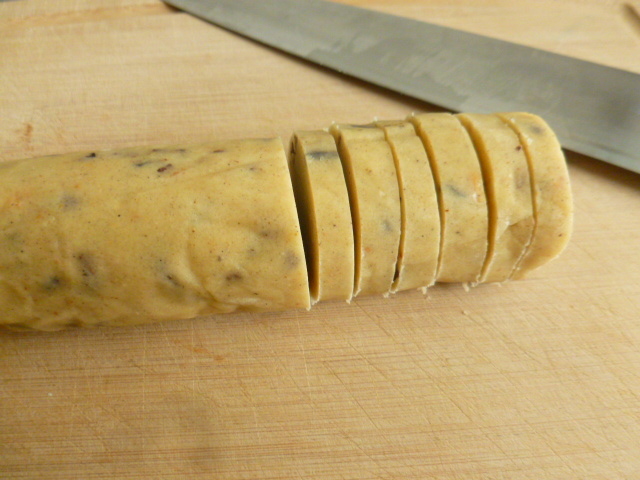 At this point, choose which way you want to prepare the cookies: rolling into logs, or rolling the dough with a rolling pin and cutting with a cookie cutter. I chose to make both, by dividing the dough in half. 4. 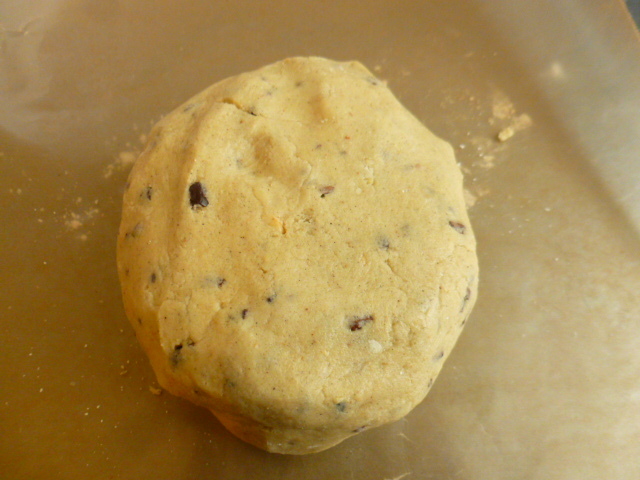 Option one: roll half of the dough into a log about 1.6” (4 cm) thick, and about 11” (28cm) long. Wrap in wax paper, and place in the fridge for 30 minutes. Preheat the oven to 3605F (180C) and line a cookie sheet pan with baking paper. Cut the log with a sharp, heavy knife, into slices, about 0.2”(0.5 cm). Bake for 10-12 minutes, until the cookies start to brown at the edges. Cool to room temperature before serving. 5. 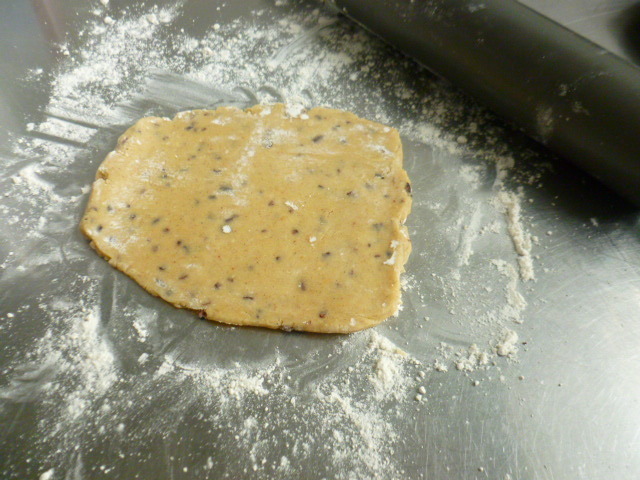 Option two: on a lightly floured work space, roll the rest of the dough with a rolling pin, to a thickness of about ¼” (0.6cm). Using a cookie cutter, cut out your favorite shapes. Bake for 10-12 minutes, until the cookies start to brown at the edges. Cool to room temperature before serving or decorating. 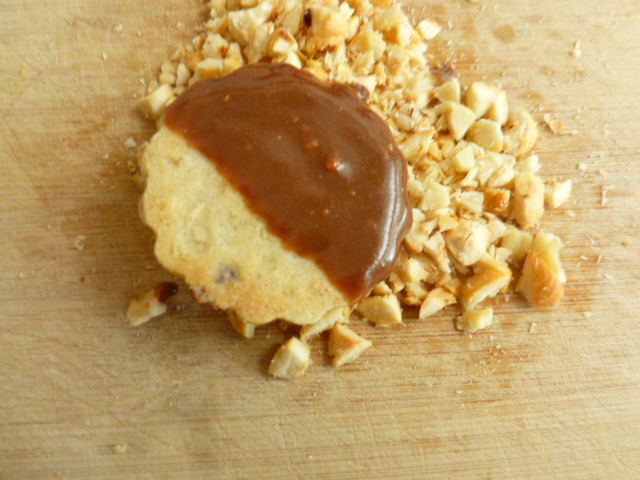 To decorate: dip each cookie in melted chocolate, and scatter chopped hazelnuts over it. Let the chocolate set before serving. Since we buy shelled, roasted, salted hazel nuts in five-pound bags, you can guess how much we like them! Refrigerator cookies are my favorite kind, and the chocolate seals the deal! We have Pfeffernusse and some star-shaped, chocolate-coated shortbread Christmas cookies from Trader Joe’s right now, but will be trying this out as soon as that supply is exhausted. Cardamom is such a good & unique flavor. I bet it’s really good in these cookies! Wow! These look sooo tempting! Love the idea of dipping these beautiful cookies into chocolate sauce and coat them with chopped nuts. Thanks for sharing a wonderful recipe. A dozen of each, please. I love cardamom in cookies and other baked goods and these look so good. The dipped cookies with the hazelnuts would likely be my first choice. Well done Ronit! Mmmmmmmm….chocolate and hazelnut! My fav! These cookies Would smell and taste amazing! The clear pictures guide reader through the whole process so well. chocolate and hazelnut is perfect and add to that cardamom, even better! love the final touches to the cookies as well. Cookies dipped in chocolate… so much tempting!!! Cardamom flavour is my favorite. Loved that all your cookies are in same size! Ronit, along with cookie cutter your recipe is too good..Cookies didn’t spread uneven while baking, so the shape remained perfect ! These cookies look divine with all my favorite flavors- chocolate, hazelnut and cardamom and then dipping them in chocolate took them to a whole new level! Yummy!